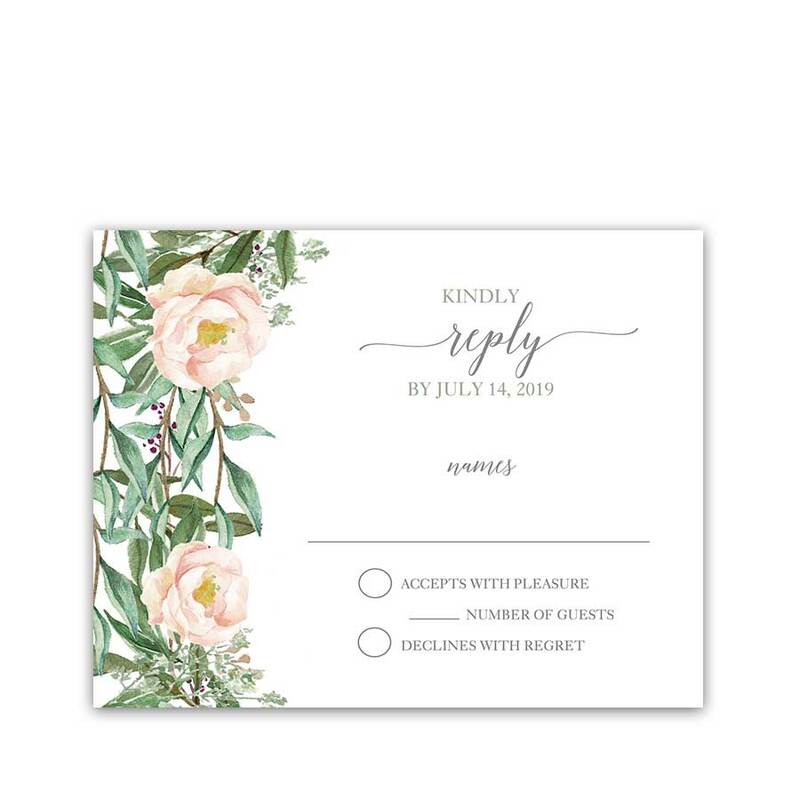 An elegant wedding rsvp postcard with blush florals and greenery watercolor florals and trendy fonts, setting the stage for a beautiful wedding response card. Choose between two paper types. All signature RSVP postcards pricing includes signature paper white or cream envelopes. Please specify your envelope color in the notes to seller. To proceed please choose number of RSVP Postcards. 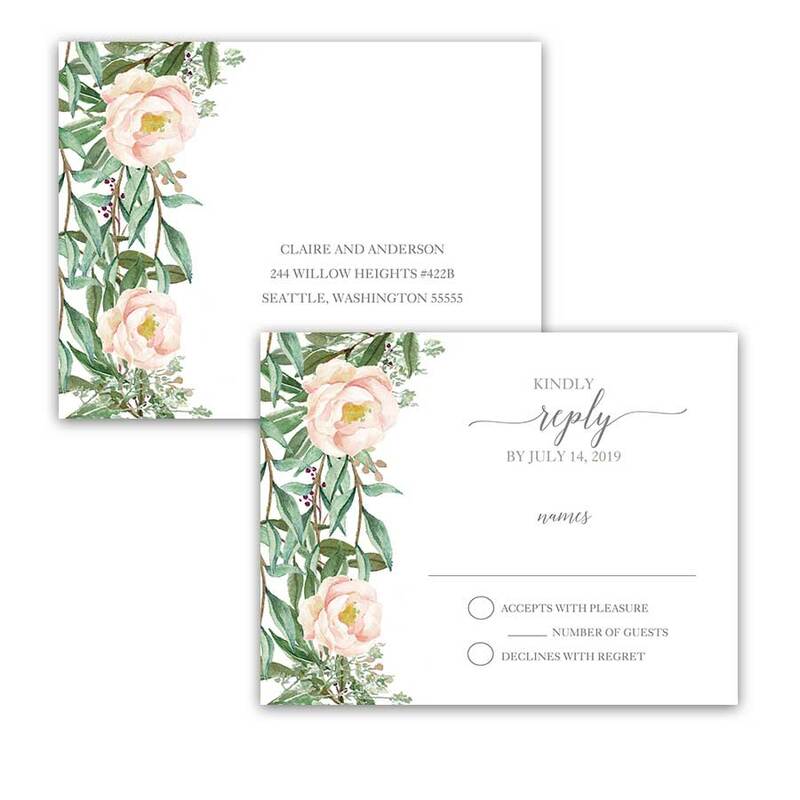 Wedding Response Postcards Blush Floral Design. 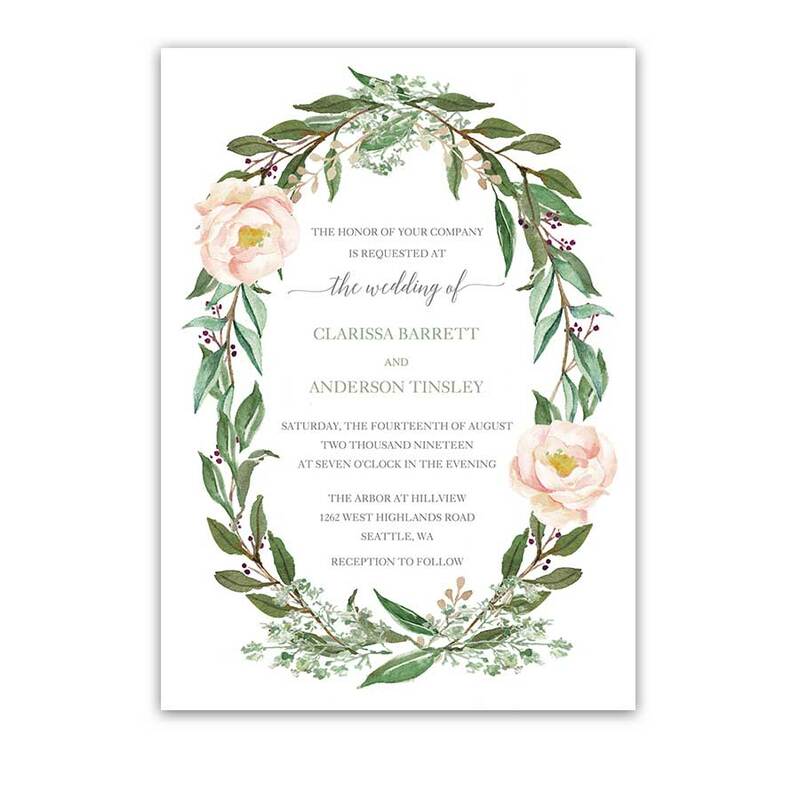 This beautiful watercolor blush floral and greenery wedding response card features eucalyptus and greenery with florals with elegantly fun lettering for floral as well as rustic weddings alike. Welcome to the Colton Hills Collection. Set on a white background, this beautiful floral wedding response postcard boasts pretty watercolor hand painted blush florals and greenery. As you can see, complimenting accessories with similar floral arrangements in variations are also in the store. Therefore, click on any item below for coordinating products in this design and let’s get your wedding planning underway! Especially relevant for: garden weddings, elegant weddings, greenery weddings, urban chic weddings, floral weddings, outdoor weddings and formally appointed weddings alike any of the months summer, spring or fall. The Wedding Response Postcards Blush Floral Design measure 5.5 inches wide by 4.25 inches long. Cards are printed on your choice of card stocks. Choices available are Signature paper and an optional upgrade to Cotton Savoy 19pt. Accordingly, please provide us with your name(s) and return address with your order for the reverse side of the printed cards. Finally, the wedding rsvp postcard will be customized with the wording provided at checkout. Please be sure to include the exact wording as you would like it to read in the space provided on the order form, along with your rsvp date.